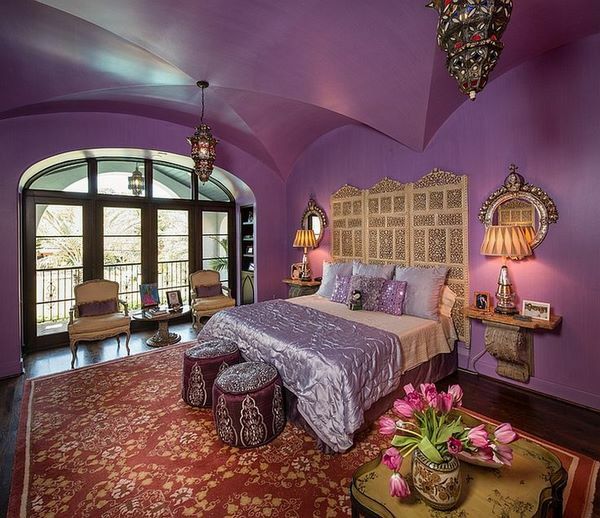 Purple bedroom design ideas reveal how creativity and imagination can create fascinating interiors where colors are used cleverly to create the perfect place for relax. 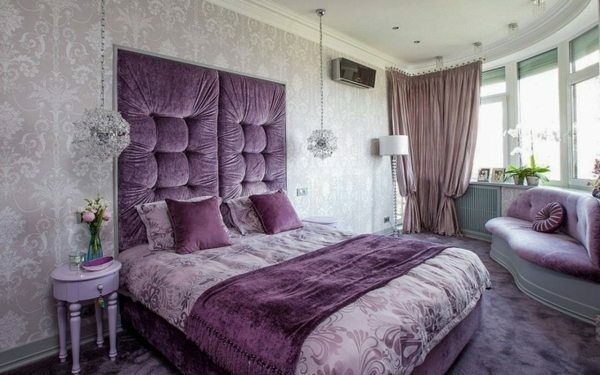 Purple is a special color and many people find it difficult to work with, especially when it comes to interior designs. Some people say that this is an emotional color, others find the dark shades of the palette too strong but when used properly it will look quite original. Purple is a complex, strong color, possessing a special energy and extraordinary sensuality. It has the properties of blue and red colors and is often described as a “harmony of contradictions”. The color can be used in the interior of any room, but when used in the bedroom it can add a delicate beauty or a royal grandeur to the interior. 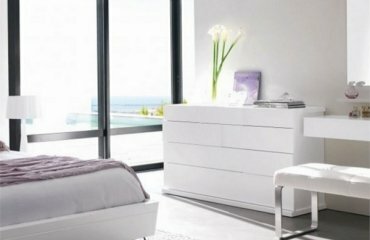 We have selected some of the most interesting and original bedroom designs and will look at the different ways to introduce purple to your bedroom, we shall give you useful tips how to choose successful and harmonious color combinations which will make your bedroom an elegant and stylish place. 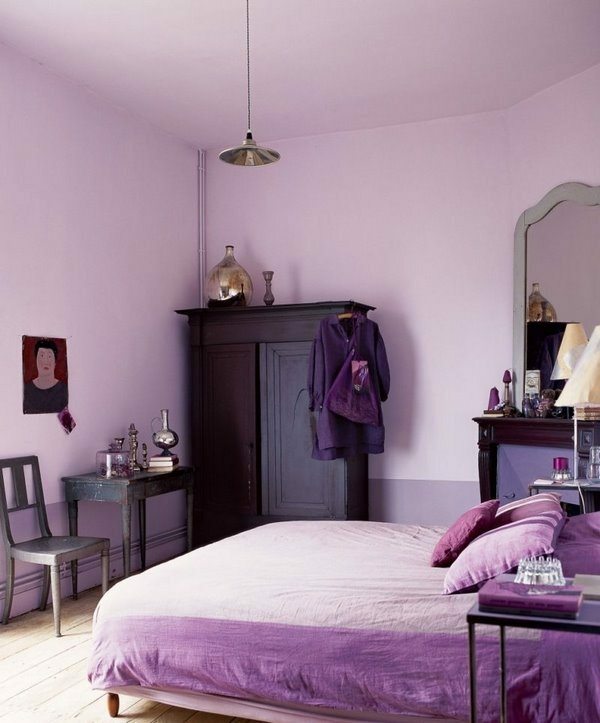 Purple bedroom design ideas feature different shades as well as interesting ways to use the color – as wall paint, in textile, as furniture color, etc. This color is quite interesting for designers, because it combines incredible tenderness and nobility and offers numerous options for creative interior designs. When using the color in the bedroom any decor will benefit from elements that create an atmosphere of chic, glamor and luxury. Let’s consider the basic rules of using purple shades in the interior and give the main recommendations of designers and interior decorators. The emotional perception of this color palette depends on its shade. The predominance of saturated, dark tones in the interior may be depressive, bright colors stimulate creative activity, while a delicate light lilac creates a sense of peace, joy and make the overall design appear very romantic. When you work with any of the shades you need to use it accurately and thoughtfully. 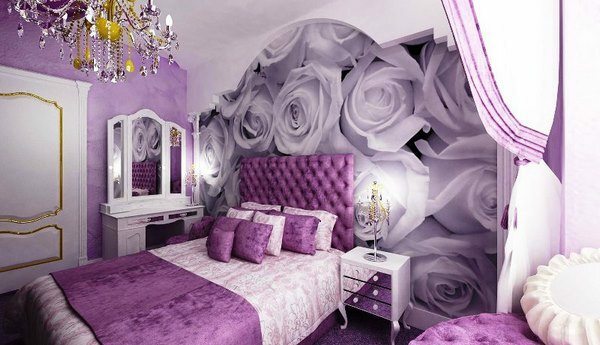 Do not just copy the violet interior of the bedroom you liked on a photo, it must be adapted to meet the requirement of every individual so that the room is cozy and pleasant. Light tones and lilac are associated with spring flowers, giving the room an atmosphere of cheerfulness and freshness. Light or pastel shades are the ideal choice for small bedrooms and are often used for kids’ rooms or teen girl’s rooms. Pale violet, lilac and lavender shades add a sense of peace and a touch of romance to the interior of the bedroom. Dark purple is a cold, saturated and even aggressive color. In the interior of the bedroom, the amount of dark shades should be dosed. Usually this shade is used as a color accent – frames to photos, cushions, pillows, duvet and curtains. 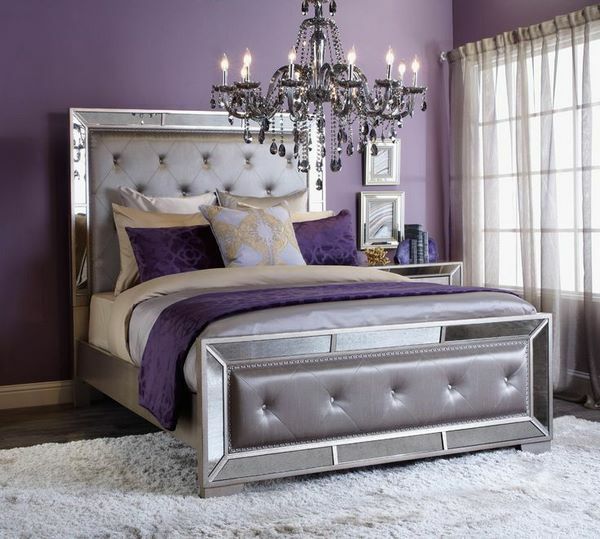 The color offers unique opportunities for beautiful purple bedroom design ideas and can be used in many decor styles – from baroque, Shabby Chic and Provence to contemporary and high-tech. In addition, this color can be used when decorating a bedroom in Oriental style like Moroccan, for example. Purple and white is a combination which enjoys an enormous popularity. 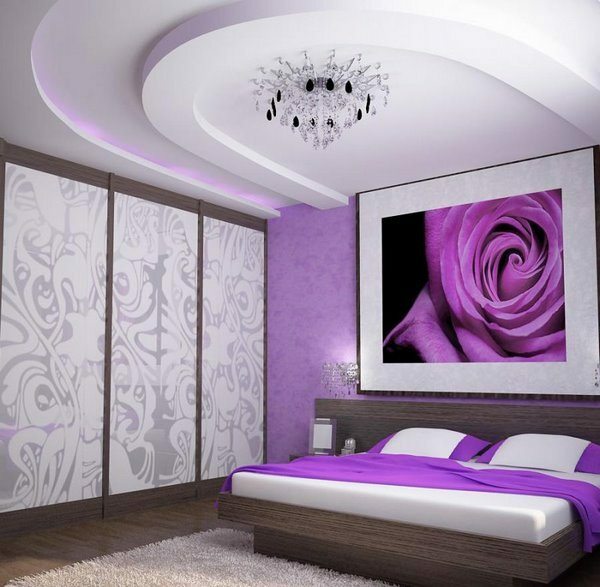 A bedroom in white will not look boring and monotonous when complemented with accessories in purple tones. In a room with violet walls, the ceiling, floor or textile should be white (or beige, depending on the particular color scheme). 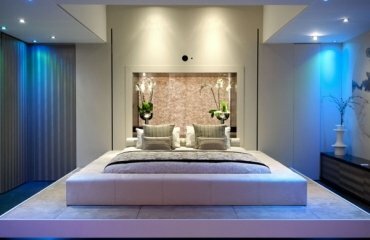 White-purple and white-beige bedroom interiors create an atmosphere of peace and elegance and look very stylish and inviting. 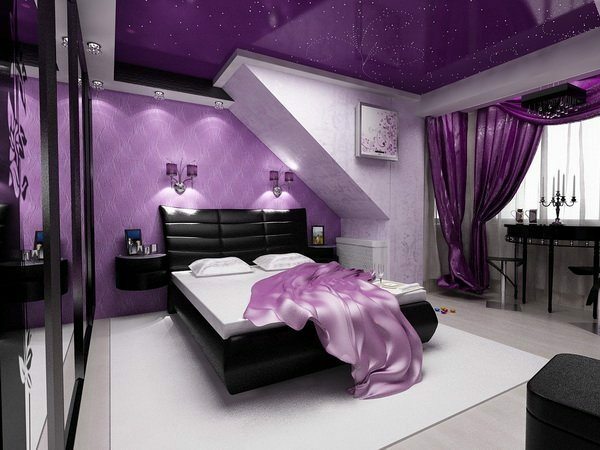 Purple and black combination in bedroom interior is more of a challenge than a problem. The main thing is not to overdo it with the number of black elements. Otherwise the room will appear too dark and the atmosphere will be too gloomy. If you maintain the right proportions of the two colors you can create a very interesting and luxurious interior. Glossy surfaces and a crystal chandelier will give the room an aristocratic sophistication and chic. Purple and gold is a harmonious and expressive color combination which allows you to use not only pale shades, but also more saturated ones. The golden palette successfully complements the violet tones and creates exceptional visual contrasts. Purple and silver is a variation of purple-gray combination, but with more glam. You can give your bedroom an elegant sophistication using these bold contrastin gcolors. 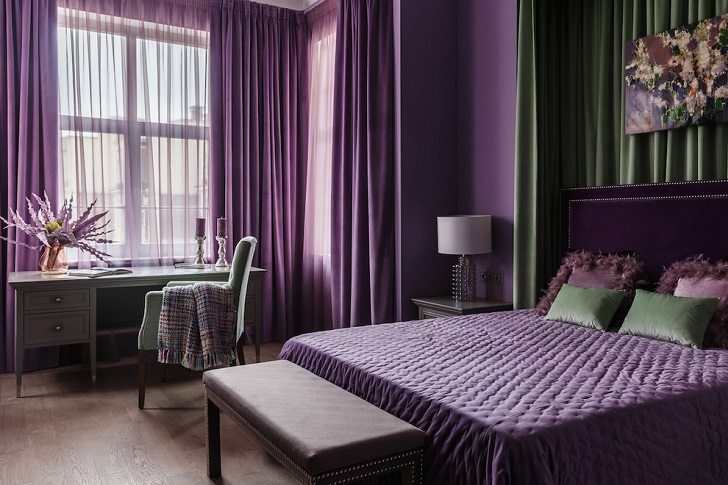 Purple and green combination gives a touch of freshness and naturalness to the design. The contrast of colors gives the atmosphere a joyful summer mood. 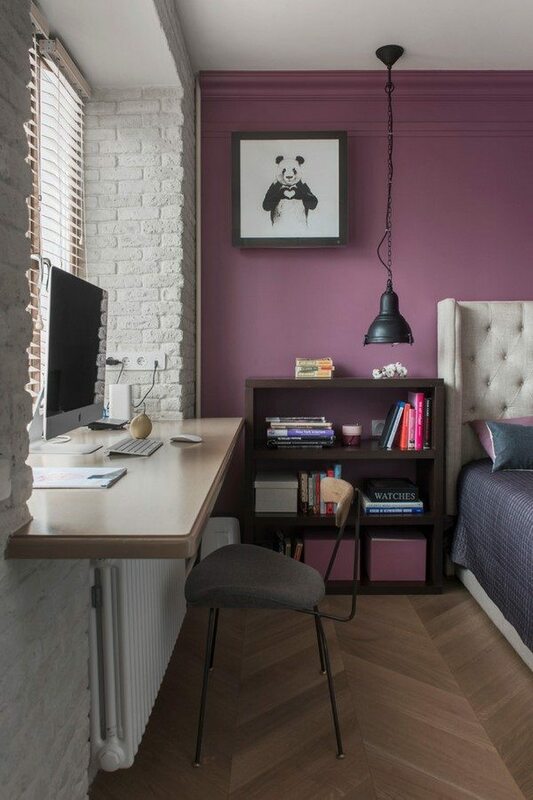 The bedroom can be decorated only in purple color but you need to create smooth transitions between different shades of the same color and combine combine the elements of the room into a single composition: furniture, walls, drapery windows and accessories. As additional accents you can add gray, white and beige. As a rule, the general mood of the room is set by the decoration of the walls: wallpaper, painting or decorative plaster. When choosing the shade for the walls you must take into account the size of the bedroom and its illumination. 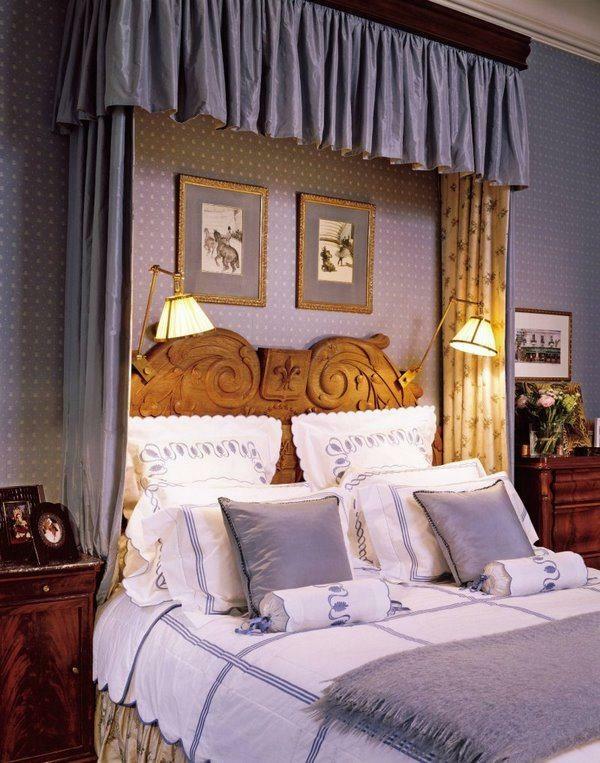 For a small bedroom it is better to choose lighter shades which expand the place and make it more airy. 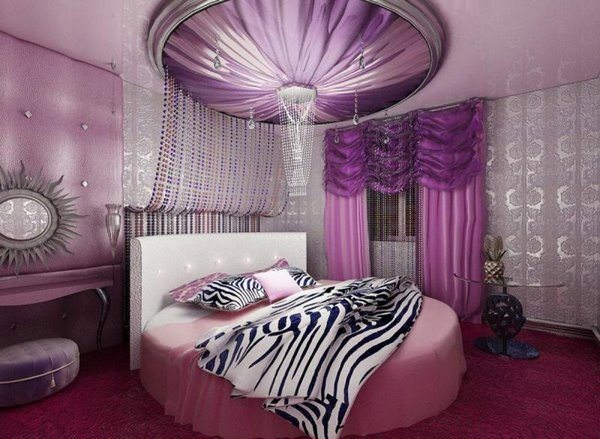 A bedroom with a low ceiling can be visually “raised” by using wallpaper with vertical violet-white stripes. 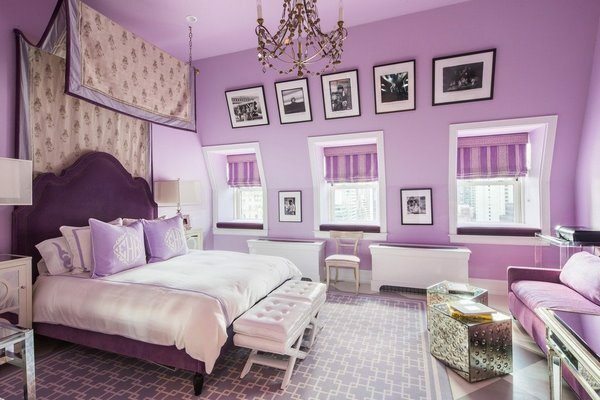 Look at the photos in the gallery below and get inspired by the amazing purple bedroom designs.